I'm happy to comment as I *have* finished a project, and I *have* mentioned you, and I *do* follow you, and I *LOVE* Heather's house blocks!!! I don't see the place to add my link ladies?! I have something to add. Great idea! Love the carefree creativity of those houses! Hope to be brave enough to try them soon! These are such gorgeous and creative blocks. Very inspiring!! I love your Tuesday idea. Maybe I can try and link something. Let me go and see if I have some photos of a cushion I made recently! Wow - I love what you made. Very creative!! I havent mentioned you in the post, simply because it was written before i knew about this. Instead I will add your button on my sidebar. Thanks for the comment on my blog. I added your button and am going to add a little comment about this being your first link party. Thanks so much for inviting me. 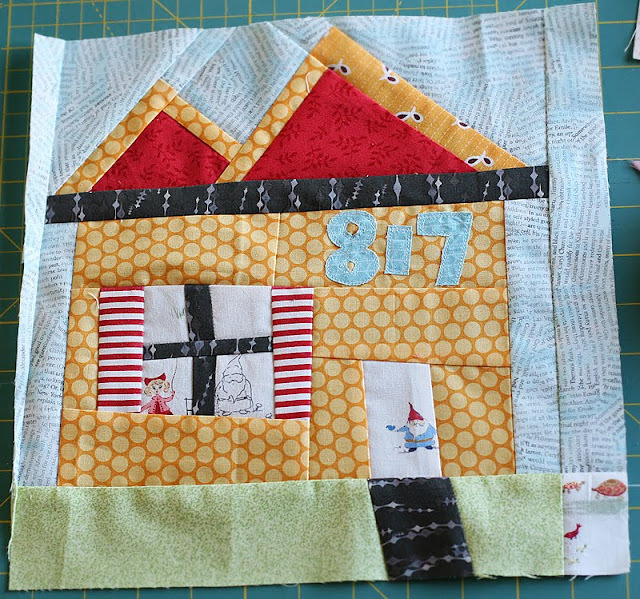 And I'm not just saying this because you told me to :-) but I really love the house blocks! Very cute and clever. I commented previously, but forgot to add that I follow! Thanks for your visit on my blog. Your button is on my sidebar. Your blocks are very creative & fun, I really love the 817 House ! Love the house blocks! 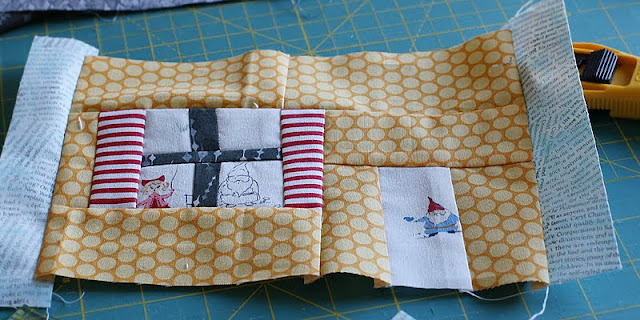 And the idea for fabric tuesdays! I love looking at everyone elses links. Oh I follow you guys, and have for forever. 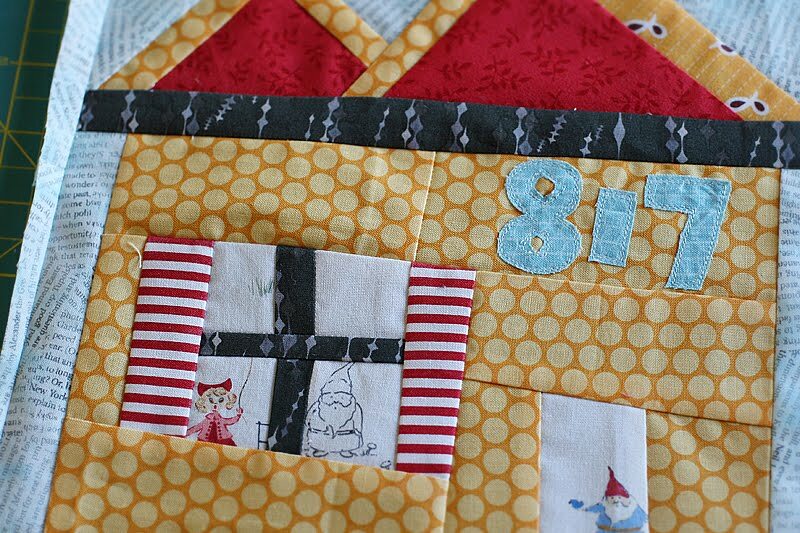 i want to join a swap like that ... how fun would it be to get all the blocks back and have your quilt pretty much finished?! There's some good "stuff" in there ladies!! You all inspire me. Seriously, those blocks are adorable! I love the mix of fabrics. Thanks for inviting us to your link party, I had never been to your little spot on the web, and I love a new find! I really liked the outhouse bit. They turned out lovely though. Loving the freestyle element. This is also a great link up. Thanks for the invite! The house blocks are so adorable! What great imaginative designing. Love the blocks, but especially the second! The children and the owl make it so sweet. Love it! Great house blocks. Are't they fun to make? You are very creative!! Thanks so much for hosting! It's so fun to be part of this creative community! Finally figured this all out, as my blog is new (and unannounced to my IRL friends yet!). But I am a follower and got my (horrid poorly lit) photo linked. 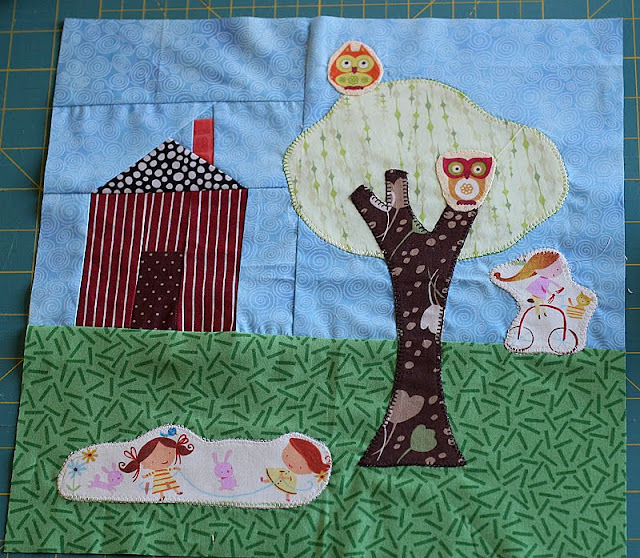 I really love the second house block--the fussy-cut appliques are great. Especially the owls! We're a day late, but next Tuesday we'll play! How fun! 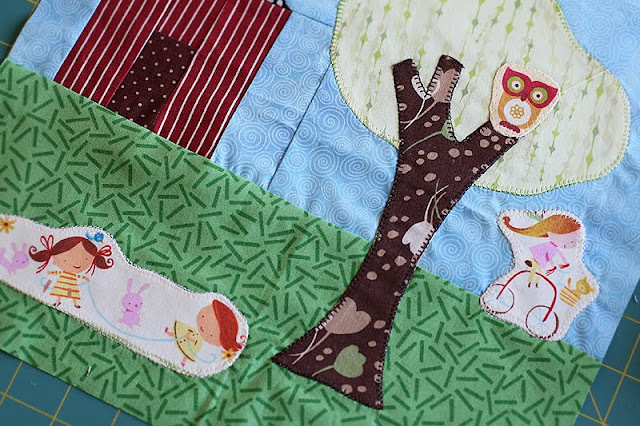 I LOVE the owl in the tree. It's so adorable! What a great idea! I want in. I'm not sure of what to do though...if you could email me and help me out. I love, love love your house blocks. I did a whole post about 'house' quilts on my blog a few weeks ago. I am fascinated by them!